If you collect fine wine, you know that extreme heat or temperature/humidity fluctuations can rapidly damage your valuable wine collection. What happens when your cooling system fails or you lose power while your storage area is unattended? Using Monnit WIT wireless temperature and wireless humidity sensors can ensure that your wine collection environment is maintained correctly. Monnit wireless sensors measure and track the environmental conditions of your storage area and send instant notifications via email or SMS text if a set condition is exceeded. The system tracks and stores your storage areas climate, providing a detailed sensor data report as well as spreadsheet export functionality. Ensure that your wine collection is kept safe by using Monnit wireless sensors. Use Monnit Wireless Sensors Anywhere You Want To Monitor Temperature or Humidity. Monnit introduces a new pressure sensor to our line of low cost wireless sensors. Behind temperature, pressure is the second most important factor to be monitored. 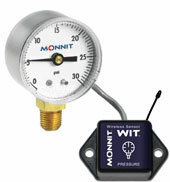 The Monnit WIT 0-200 PSI wireless pressure sensor can be used anywhere a pressure gauge is needed (gas, liquid or vapor). High quality pressure sensors like Monnit’s can range between $600-$1,000. Monnit’s new pressure sensor is sold at an industry leading $299. The Monnit Wireless Pressure Sensor is available for purchase through the Monnit Online Store. Prior to Monnit shipping your wireless network, your sensors are tested in our lab. This means we form and operate the network in-house. Upon set-up, the sensors and gateway lock onto the most clear RF channel for our facility and begin communicating. The next time the sensor network is plugged in (presumably when you are installing the sensors), your network is still locked onto the same channel that was optimal in our test facilities. However, that may not be the optimal channel for YOU in YOUR location. Thus, we recommend you reset the network prior to deploying the sensors. This will help you achieve the best range for your sensor deployment. From the Sensor Network list, select the edit pencil of the gateway you wish to reform the network. 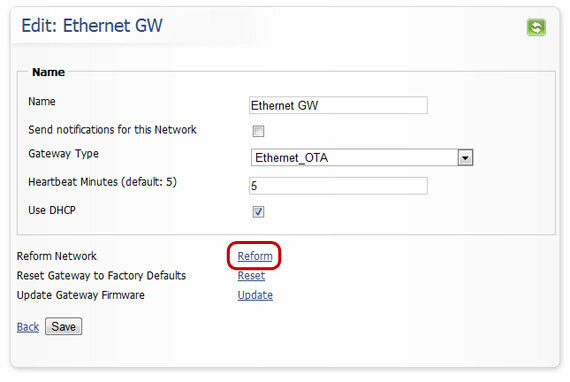 From the options below, select “Reform Network” and wait until the Ethernet gateway has processed the command and reset itself. You will know this is complete once all three LEDs on the Ethernet gateway are green again. Begin inserting the batteries into your sensors. Your sensor network is now operating on the most optimal RF channel available in your area.